Born-Againism | The Old Adam Lives! “Prostrating himself and touching his forehead to the ground, Mathieu Pawlak put his demons to rest. Once a practicing Catholic tormented by a spiritual void and the searching questions of youth, Pawlak embraced Islam and, he says, found peace…. 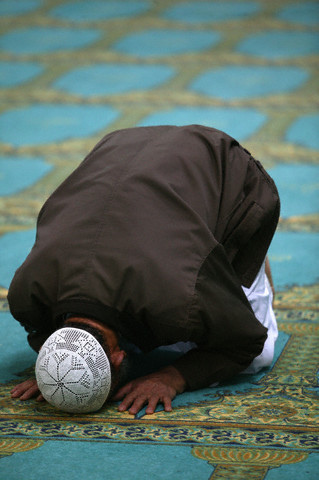 “I found the way that Muslims pray to be truly profound. It links the body and the heart,” said Pawlak (New York Times, 1/16/06, “Officials concerned about Muslim converts,” emphasis added). Acts 16:15: “[Lydia] was baptized with her household…” Household = men, women, children, and slaves. Up until 140 AD there is no reference to infant baptism or adult baptism of those from Christian families. Adult baptism is deferred infant baptism. What is really real? Experience? Feelings? Experiences fade away. Feelings come and go. Some never have spiritual experiences. Furthermore “…even Satan disguises himself as an angel of light” (2 Cor 11:14). “But even if we, or an angel from heaven, should preach to you a gospel contrary to that which we preached to you, let him be accursed” (Gal 1:8). Pride – If I do or feel the “right thing,” I am caught in spiritual pride. I’ve done it right. I’ve contributed my share. Despair – How to know when I’ve believed earnestly enough? Has my decision for Christ been heartfelt? Has it stuck? Discipleship: “They’ll know you are Christians by your love” (!?) We have to make it happen. And we can make it happen. Claim that evidence of faith can be provided. Luther’s rediscovery of the gospel: We are totally righteous and totally sinful. Faith, by definition, is hidden, hidden under the cross. What’s real? The promises of God – outside of us, in spite of us. – Thanks to flickr and to buzzwordindia2010, for the photo. And thanks to CrossAlone Lutheran District for the content of this post. It means that God is the one acting in Baptism…for the sinner. In this example, for the infant, who has original sin. God acts first. Gives His promises. Gives His name. Adopts the child (or whomever). It’s a perfect example with babies, because they haven’t a clue as to what is going on and therefore they are not ADDING any of their “seriousness”, or “commitment”. It’s all God. For more on Baptism, click on the ‘Baptism’ category (left side of page). There are some really good resources in there. Thanks Steve! I’ll read that article. Also, I find “promises of God – outside of us, in spite of us” very comforting. Comforting that even when I feel bad or feeling less Christian-y, my Hope remains and my Righteousness did not change. The promises of God…graciously hidden in the cross, outside of our boasting. The one way we can fully and finally answer the question, “How do we know…” Thanks Steve! You are really depressing and unedifying to read. It is a huge source of pride to think that you belong to the “right” group or denomination. This isn’t a sports team. It is the body of Christ with many parts. The object isn’t to beat the other members. Remember who the enemy is, it’s not our brothers or the other parts of Christ’s body. I wasn’t aware that I, or my pastor (whose sermons and classes are regularly featured here) have ever said that one must be Lutheran to get it. We believe that we do know the truth. But we believe others know it, as well. What we do push forward here, is the freedom that Christ has so dearly won for us on the cross. If that’s not for you, then so be it. Thanks for stopping by.